Let me show you the interesting Facts about Rhythmic Gymnastics in the following post. The individuals or groups may follow this type of sport. 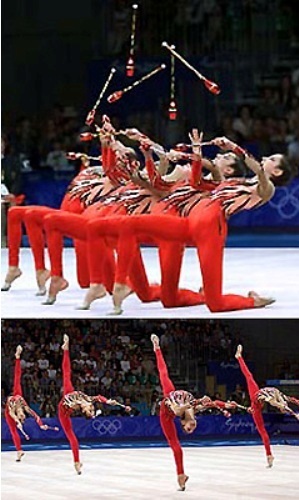 There are five types of rhythmic gymnastics according to the apparatus. The freehand one is without any apparatus. Others include the ribbon, clubs, ball, hoop and rope. This sport requires the individual to master apparatus manipulation, dance, gymnastic, and ballet. To become the winner of rhythmic gymnastics, the participant should earn the most points. Facts about Rhythmic Gymnastics 2: who gives the scores? A panel of judges will give score for each participants related to the execution, leaps, pivots, apparatus handling and balances. The level of gymnast will determine the types of balances to master. The high degree of athletic skill and flexibility movement should be mastered by the gymnasts. The hand-eye coordination, dexterity, flexibility, power and strength are the primary physical abilities that rhythmic gymnasts should have. The governing body of rhythmic gymnast is FIG, which stands for Federation Internationale de Gymnastique. All aspects of international elite competition are under the regulation of rhythmic gymnast. Code of Points is also designed by FIG. Grand-Prix Series, World Championships, Olympic Games, World Cup and European Championships are included in the largest events of rhythmic gymnastics. The ideas developed by Rudolf Bode, François Delsarte and Jean-Georges Noverre led into the development of rhythmic gymnastics. The aesthetic gymnastic was promoted by Peter Henry Ling in the system of free exercise in 19th century in Sweden. The Medau School was established by Hinrich Medau in Berlin in 1929. He developed the use of apparatus in gymnastics. He also established modern gymnastics. In 1940, Soviet Union had the competition of rhythmic gymnastics. In 1963, Budapest became the host for the first World Championships for individual rhythmic gymnasts. The Summer Olympics in 1984 had rhythmic gymnastics. The group competition of this sport was included in Summer Olympics in 1996. The first Olympic Gold Medal for a rhythmic gymnast was obtained by Lori Fung, a Canadian. Do you have any comment on facts about rhythmic gymnastics? Share the post "10 Facts about Rhythmic Gymnastics"
Facts about Taekwondo show you some important information about a Korean..